Today’s post is contributed by my friend Joseph Hogue. He worked as an equity analyst and an economist before realizing being rich is no substitute for being happy. He now runs five websites in the personal finance and crowdfunding niche, makes more money than he ever did at a 9-to-5 job and loves building his work from home business. Making investing personal with an investment plan will help you avoid the worst mistakes investors make. Turn on the TV to any financial news program or click through to any investing website and you’re likely to get bombarded by generalized investing advice. Buy this stock, don’t buy that one. This sector of the economy will benefit the most from the current economic trends while another sector will languish. It’s a mass-market approach to investing, designed to reach the absolute largest audience possible. The problem is that this mass-market approach to investing is just as likely to leave you penniless as it is to make you rich. Investing advice made for everyone serves no one at all. Just as a prior article on asset allocation pointed out, there is no one-size-fits-all investment plan. Investing advice may fit us all into cookie-cutter strategies for the sake of convenience but it isn’t the advisor that has to pay for your retirement when you come up short. The solution, realize just how personal investing is and start asking yourself the questions that will help you build the perfect investing plan for YOU! Everyone loves to talk stocks and that next hot investment. From traditional financial news channels to investing blogs, it’s all about beating the stock market. But let me ask you a question, does that percentage return on the stock market have anything to do with your retirement goals? Whether the stock market rises or falls doesn’t change the fact that you’ll be retiring some day or paying tens of thousands for your child’s education. Investing is about YOUR needs and YOUR goals, not about finding the stocks that will produce double-digit returns on your money. Making sure you’re able to reach your goals, avoid a growing retirement savings crisis or send your kids to college, means understanding what investments will get you there. That starts with asking yourself some personal questions to find the best investments for you. What Investing Questions Should You Ask Yourself? The one thing you usually won’t get when you turn on your favorite investing show are the most important questions you should be asking yourself. It’s these questions that get drowned out in the constant noise of picking stocks to beat the market. These questions are where investing starts. It’s these personal questions that will be the foundation of your personal investment plan that will help you reach your goals with the least amount of stress possible. How old are you and at what age do you plan on retiring? What does retirement look like for you and how much will it cost? Saving for retirement? That’s great but if you don’t know what retirement looks like, it’s going to be impossible to stick to your saving. Make a mental image of what you’ll do each day. This will not only keep you motivated to reach your goal, but you’ll also have a better idea of how much it will cost. How much do you have saved now and how much can you reasonably save each year? Be realistic with how much you can save each month. Who wants to be a millionaire at 65 if they had to live on oatmeal for their whole life? Enjoying your money now is just as important as enjoying it later. What else do you want to do with your money? Will you use some of it to pay for your kids’ education or for other large expenses? Because some of these large expenses come at different times, it might change how you invest for them. You’ll have less time to recover from stock market losses for tuition savings you need in a few years so best to hold them in safer investments. 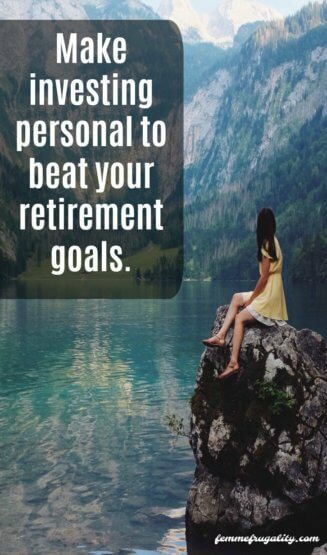 How important are your financial goals? Are some less important than others or are there alternative ways to meet some goals? You may want to invest must-reach goals like retirement and education in less risky investments, but you can take more risk, and maybe get higher returns, in less important goals. Using a retirement calculator will give you the rate of return you need on your investments to reach your retirement goal but making your investments personal is more than just the numbers. One of the biggest factors in your personal investment plan is called your risk tolerance. Rather than all the numbers, this is your personality and how you react to risk. Do you tend to stress out easily? Do you prefer the slow and steady or are you a thrill-seeker? You can take a risk tolerance questionnaire online, but it really comes down to two questions. How much time do you have to invest before your goals? How would you react to a 20% drop in your investments? If you have more than five or ten years to retirement, you can withstand the ups-and-downs of the stock market. Even if a stock market crash wipes out a lot of your investment, you’ll have time to see your portfolio bounce back. If you don’t tend to stress out over big changes in your portfolio’s value, then you can take a little more risk in the stock market and enjoy a higher return over time. If a 20% drop would cause you to lose sleep or panic-sell at the wrong time, then you might want to hold less in stocks and more in bonds. Once you know the annual return you need to meet your investing goal and your risk tolerance, you can put them together for an asset allocation that will reach your goal with the least amount of stress possible. As a general rule, stocks provide a 7% to 9% annual return when averaged out over a decade or more. Bond investments provide 3% to 5% returns but are much less volatile than stocks. If you get stressed out easily or have only a few years left to retirement, you’ll want to invest more in bonds than stocks. On the other hand, if you have a high tolerance for risk and many years to your goals, you can afford to take more risk in stocks for a higher average return. The percentage you hold in stocks versus bonds will give you an idea of the average return you can expect. For example, if you have half your portfolio in stocks and half in bonds, you can expect an average return of 6%. NOTE: These percentages are general rules and are not a guarantee of a certain return. The problem many investors confront is they need an average return above 8% so they invest everything in stocks with no consideration to how a stock market crash will affect them emotionally. At this point, it’s better to either find ways to save more or lower your retirement goals a little so you don’t need such a high return rather than take more risk than is appropriate. You don’t have to be a professional financial planner to make the right investing decisions. (Though if you want one, you may want to research robo advisors with financial planners.) Investing according to your personality and needs will help you avoid bad investing behaviors and fit the best investments for your goals. Listen less to what the TV tells you about investing and more to what your own goals are telling you. This entry was posted in Money Management, Ways to Make Money on December 27, 2017 by femmefrugality. Excellent reminder that investing is very personal, especially when it comes to goals, time frame and risk tolerance. I like to encourage people with a long time frame to take a some calculated risks for greater potential returns, because there is that time to recover if it doesn’t work out. They say that women tend to be much more risk averse by nature…a bonus when it comes to car insurance rates, but it may hold us back in our investment potential. Absolutely Kat. How we handle risk and how it affects our financial goals can swing both ways. We all know what happens from too much risk but taking too little risk can also be bad.